LIQUIDYN are specialists manufacturers of Non-Contact Micro Dispensing Systems, designed for applications where accurate and repetitive volumes of material need to be dispensed in volumes ranging from 3 nanolitres and up either as repetitive micro dots, beads or fixed volumes. The high quality micro dispense valves can dispense a large variety of low to high viscosity materials including SMT Adhesives, Anaerobic Adhesives, Super Glues, Cyanoacrylate Adhesives, 1 and 2 part Epoxies, UV Adhesives, Lacquers, Silicones, Greases, Oils, Soldering Fluxes, Weak Acids & Alkalis and Ethers to name a few. The LIQUIDYN Non-Contact P-Jet CT Micro Jet Dispensing Valve for instance, is capable of delivering up to an astounding 280 micro dots per second with consistent results. Anaerobic adhesives such as LOCTITE 648 can now be precisely deposited without contacting the part as a result of the newly developed P-Dot AN Micro Dot Dispensing Valve. The new valve applies the adhesive by projecting a small drop over a distance of up to several millimetres (Jetting) between nozzle exit and work piece creating uniform and repeatable micro dots of adhesive on the part with no splatter. The main problem in the past, when jet dispensing anaerobic adhesives (i.e. Super Glues), was the fact, that when an anaerobic adhesive comes into contact with metallic valve components in the anaerobic conditions found inside the valve, this would lead to the rapid hardening of the adhesive in the valve rendering it useless. With clever material selection for all wetted parts and careful design of all dynamic parts, LIQUIDYN has managed to overcome the natural tendency of the adhesive in this situation to cure. The P-Dot AN has an industry proven service life of in excess of 100 million cycles. LIQUIDYN Micro Dispense Valves can be heated for use with viscosity sensitive materials to aid consistency in the dispensed end product and closed loop sensors can be added to detect the drop being ejected to verify the dispense has been carried out. Heating also ensures that you get consistent results regardless of the ambient temperature - set the heating just above maximum ambient temperature in the summer and get consistent results all year round. 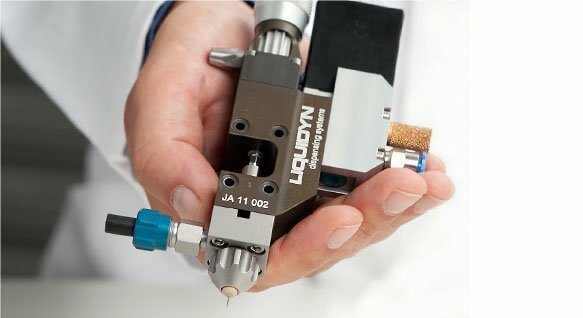 LIQUIDYN systems utilise a simpler technology compared to Piezo Dispensing Systems, which means that…..
LIQUIDYN Micro Dispense Valves are more robust than Piezo Valves – The more complicated, the more things that can go wrong !! For all these reasons the LIQUIDYN is a more cost effective and optimised solution for precision micro dispensing application.